In the modern news media industry, objective reporting and personal opinions increasingly share the same space. Many prominent, well-respected journalists maintain an active social media presence — in fact, they are almost expected to — giving readers unprecedented access to journalists’ thoughts, personalities and beliefs. It is clear that many journalists who publicize their personal opinions, whether directly or indirectly, still produce high-quality, objective reporting. But enmeshing news and opinion also opens the media to criticism, and in our current national environment, that criticism presents a threat to the credibility of journalism and reporting. Journalism presently faces accusations of bias from a broad swath of Americans. Whether they decry “alternative facts,” smear unfavorable reports as “fake news” or view mainstream news outlets like CNN as a “fraud news” network, many Americans have lost trust in the media’s credibility. Statistics bear this out. In a poll commissioned last September by the Knight Foundation and Gallup, 69 percent of American adults reported that their trust in the media has declined over the preceding decade; just four percent said that their trust level increased. Though some attacks on the media are baseless, the fact remains: Many Americans do not trust news media. And that’s a problem. Journalists have served as the unspoken “fourth branch” of government — a check on institutions, organizations and leaders. If our society no longer trusts journalists, where will it turn for transparency and accountability? Media organizations have not fully addressed the ethical dilemma posed by new technologies that reveal people’s politics and divides over the very nature of the truth. We on the Editorial Board are grappling with these issues. We face many of the same challenges that larger media outlets face, but in a different context. We find ourselves on a college campus with an undergraduate enrollment of around 4,400, surrounded by what community members sometimes lovingly, sometimes woefully, call “the Dartmouth bubble.” Our news staff may be journalists, but they are also students who live in the community on which they report, and who have friends, or friends of friends, with whom they necessarily interact. In other words, the space we share with one another includes not only the technological space — our Facebooks, Instagrams, Twitters, LinkedIns — but our physical space as well. Staff at The Dartmouth undergo ethics trainings that teach them to recognize and eliminate their own biases, and to avoid taking on stories in which they have any potential conflict of interest. 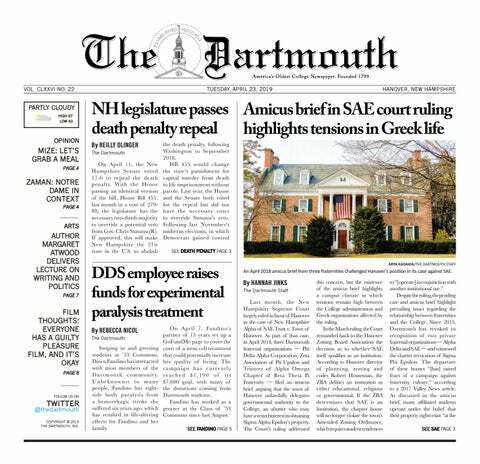 Moreover, while writers are able to explore their passions in various sections at The Dartmouth, the separation between News and Opinion remains absolute. We have these and other mechanisms in place to guide us, but we continue to ask ourselves these questions as journalism continues to evolve. We recognize that every journalist’s dual identity as reporter and individual is compounded on this campus — and we will continue to account for that reality as we strive for objectivity and accuracy in our reporting. As we move forward, we continue to push ourselves to understand how being in this environment affects our coverage, and how we want to stake our claim as journalists in this context.